PC components and SFF PC specialist ZOTAC has designed a portable PC system which fits in a backpack. It thinks that the system could provide an untethered premium PC VR experience – making the most of the otherworldly immersive possibilities. 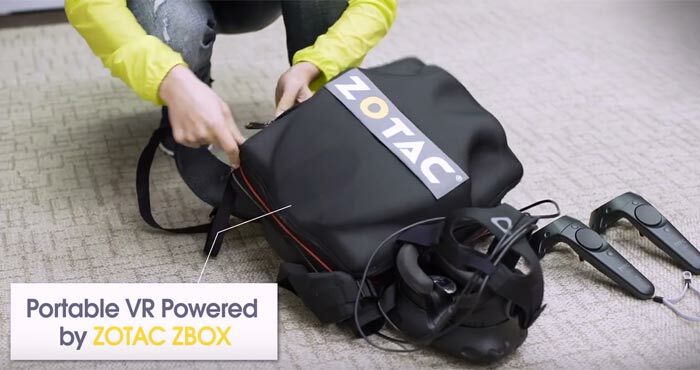 The ZBOX Mini PC Powered Portable Backpack was announced by ZOTAC last week and we were provided with a demonstration video, as embedded below. However, we haven’t been provided with full specifications of this untethered VR system. Being a VR-ready system we expect the key performance components to include at least a quad-core Intel Skylake CPU and a graphics card such as an Nvidia GTX 970. Many ZOTAC SFF PCs for gaming feature such components. It would have been interesting to see some of the system spec options and learn about the battery capacity and typical untethered life. I’ll be watching out for further details of this portable VR system in the coming weeks / months. A GeForce RTX base unit for under £900. The 50-incher gets battery-backed mobility, and a new 85-inch version is teased. And it demonstrated a 6.18-inch foldable display for clamshell smartphones too. Acer launches Helios 700 gaming laptop with sliding keyboard Nvidia GeForce RTX 2080 Ti overclocked to 2.94GHz MSI GL63 laptop with GeForce GTX 1650: promo slides shared Nvidia expected to roll out GeForce GTX 1070 with GDDR5X QOTW: Which AIB makes the best graphics cards? must be a hell of a battery ? That thing must have a pretty beefy battery, even if they powered it with a mobile processor and GTX980 it's got to use a lot of juice. Having trouble wrapping my mind around this battery. I actually thought the progression would be like steam link + VR where you stream the games to a headset. Never saw this coming. I'm sure I could fit my rig and UPS into one of my mountain packs. 30 minutes of awesome gameplay and three months visiting a chiropractor - a good trade?